Frosty Fan Packs [Frosty Fan Packs] - $12.95 : NewDaVincis.com!, Great Innovative Products, Gadgets and more. What a clever way to increase your fans cooling power! 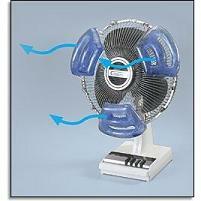 Simply freeze the fan packs in freezer then attach the three packs onto your fan. Now your fan will be circulating cold air. Frosty Fan Packs are the new way to save money, saveÂ energy and stay cool. Get cold air circulating just like air conditioning, providing fast heat relief on those brutal days when the power of an ordinary fan just isn't enough! Simply place plastic gel packs in freezer until frozen, hook onto any Portable, table or box fan with grill. Fits most fans. Set of three. Frosty Fan Packs are. . .
portable?take them with you on vacation. Use them at. . .
portable fan with a protective shroud. *Frosty fan Packs are not meant as substitute for air conditioning. They cannot cool an entire room and are designed to increase your fan's power to cool your personal space.